Hola, CF readers! 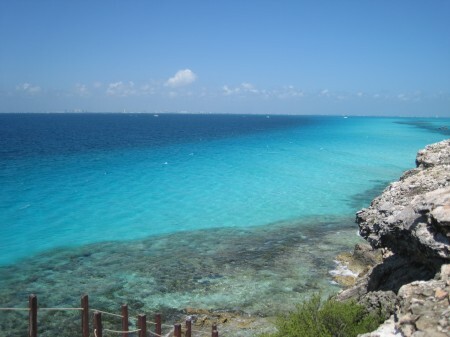 I’ve just returned from a wonderful week in Mexico, where July temperatures can reach 90 degrees Fahrenheit and beyond! Therefore, I have some first-hand experience to share with you all about wearing makeup on hot and sunny days. Whether you’re on a tropical vacay yourself or enduring the heatwave at home, continue reading for some tips to prevent makeup meltdown. 1. First Things First: Protect Your Skin. No post about cosmetics for warm weather would be complete without a sunblock mention! 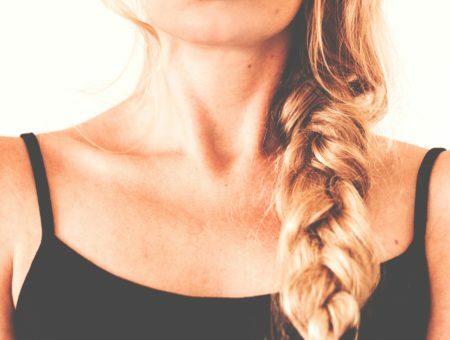 We should all be aware of the dangers of the sun’s harmful rays, so if you haven’t already, please check out SkinCancer.org to learn about protecting yourself. 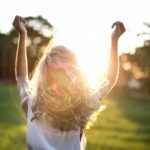 These days, there are just no excuses – lather on the sunscreen! And remember to reapply every two hours or after sweating or going in the water. 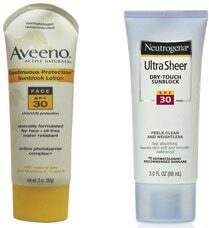 My personal favorite:Aveeno Sunblock SPF 30 For Face. I cannot rave enough about this product. I have fair skin and it did not burn once during my week in Mexico. The lotion maintained its protection through sweat and water, plus it never felt greasy. Also try:Neutrogena UltraSheer Dry Touch Sunblock SPF 30. This is a big CF favorite – it gets rave reviews across the board and offers extra protection from harmful UVB rays. 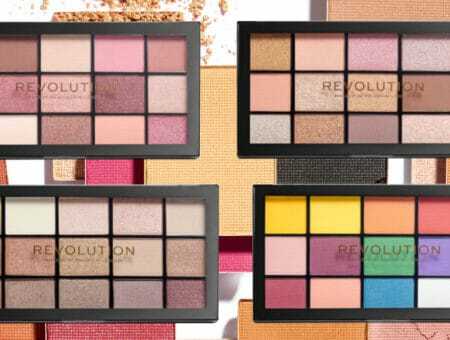 To ensure a long-lasting makeup look in hot weather, it is essential to begin with a good base. After allowing your sunscreen to soak in, apply a thin layer of makeup primer – this will create a smooth skin surface and give your makeup something to adhere to, allowing it to stay all day. My personal favorite:Make Up For Ever HD Primer. This product goes on super smooth and lasts forever. If you don’t feel like wearing foundation, just wear this over your sunblock for smooth, practically pore-less skin. 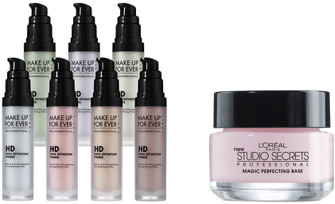 Also try:L’Oreal Magic Perfecting Base. If you’re on a budget, this primer is available at your local drugstore, and has received decent reviews on MakeupAlley. It’s great for filling in pores and creating a smooth, luminous canvas for makeup. 3. For Your Face, Think Light and Sheer. 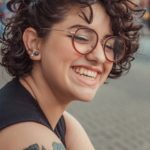 Just as you don’t pile on thick layers of clothing during the summer, you should also refrain from piling on on heavy layers of makeup – it will likely melt right off, or worse, clog your pores. Ditch the heavy concealer or cakey powders and opt for sheer foundations and blushes. Tinted moisturizers, such as CG Smoothers are a great option for summer, many even include extra SPF protection, too. If you want more coverage, try sheer foundations, such as COVERGIRL NatureLuxe Silk Foundation, which contains a hint of cooling cucumber water. When it comes to blush, save the powder versions for when the temperature drops. Instead, try cheek stains or cream blushes. I have combination skin that can be dry or sometimes oily and I find cream blush to be perfectly moisturizing without feeling greasy. My personal favorite:Mary Kay Cream Blush. I adore the Cranberry shade – it’s flattering on my fair skin, but also looks great on my friends who have more of a natural tan. Also try:Tarte Cheek Stain and Almay Smart Shade Blush. The former is a well-reviewed Sephora pick, while the latter is available at drugstores and adjusts itself to your natural coloring for a flattering shade. 4. Stock Up on Waterproof and Long-Lasting Eye Makeup. Even if you’re not going to spend the day at the pool, it’s a good idea to break out waterproof and long-lasting eye makeup formulas during the summer because they will last all day even when you’re sweating. First up is waterproof mascara – a total essential if you’re going to be doing any swimming. It’s very likely the mascara you normally use is also available in a waterproof formula, so it should be easy to find the best one for you. My personal favorite:COVERGIRL LashBlast Waterproof Mascara (in Very Black). I put this mascara through the ultimate test in just 24 hours: It lasted through an early morning downpour, a very splashy boat ride, and a swim in the ocean. When I made it back to dry land that afternoon, this mascara was basically the only thing left on my face, and I still received a compliment that my eyes looked good. How’s that for a recommendation?!? It’s also useful to stock up on some long-lasting and waterproof eyeliner. If you’re an eyeliner addict like myself then they will definitely be used year round. 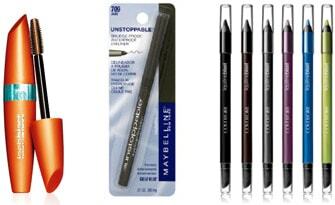 My personal favorite:Maybelline Unstoppable. This eyeliner will last through just about anything, and comes in an easy-to-apply pencil. Also try:COVERGIRL Liquiline Blast. 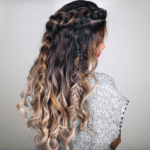 This line has received great reviews, and includes more shades than just your basic black or brown. Bonus Tip: Leave your eyeliner stick in the freezer for a few minutes before applying. Not only does it feel refreshing, but you will be able to create a more defined line. 5. Protect Your Pucker, Too. Lipgloss addicts, you’re not gonna like this: Really shiny lipgloss can actually increase your chances of getting sunburned lips. So if you’ll be out in the sun, your best bet is to stick with lip stains and lip balms. As an added bonus, lip stains also last much longer than glosses. My personal favorite:Stila lipstain. This versatile stain comes in many flattering shades and also doubles as a cheek stain. Also try:COVERGIRL Outlast lipstain or Revlon Just Bitten. Both are more affordable options in comparison to the Stila. After applying the lip stain, keep a tube of lip balm handy all day to reapply for protection – and make sure you find one that includes SPF! My personal favorite:Burt’s Bees. This balm is all natural and includes SPF. Also try:Chapstick. An oldie but goodie – this stuff moisturizes your lips and provides SPF 4 protection. As always, it’s definitely not necessary to follow all of these tips verbatim. As with any makeup or fashion advice, you’ve got to make it work for you. However, don’t forget the most important step – sunblock lotion, for your face and body. That one is just non-negotiable. What do you think of this melt-proof makeup advice? Will you be adding any of these tips to your beauty routine? I’d love to know how they work for you, so be sure to share. Also, what are your favorite summer products? I always learn so much from your comments so be sure to leave one! Next Beauty Video Tutorial: Go-To Going Out Makeup Look & Bonus Tutorial!